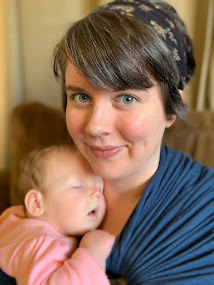 We've been married for eleven months. We've lived in this house for a mere nine months. Therefore, I am continually deeply perturbed by the overwhelming amount of stuff we have managed to accumulate in that short time. Like most people, when I come home from work, I'm usually pretty grumpy. I'm tired, achy, spent from dealing with people all day, and impossibly hungry. But instead of being calmed down by my home, I grow more agitated by the mess. Dog toys all over the carpet. A pile of unopened mail on the table. Dirty dishes in the sink. SO MUCH RANDOM STUFF on the kitchen counters. It's not just this sort of general, everyday dirtiness, the kind that results from two busy, always-working adults with little free time, that bothers me. It's how my closet is jammed full of clothes; clothes I don't even like, or that don't fit right, or that I only bought because they were on sale. It's all the books and movies and CDs that are just sitting around in random places because we've run out of places to properly store them. And yes, it's even all the cute little decorative items I've picked up at Target or Hobby Lobby or anywhere else over the years for my *future home* that are so plentiful in abundance now that they're starting to smother me. You know how I just said we've been here for nine months? There are still boxes in our basement that we haven't unpacked because we don't have room to put the stuff. Did you get that? We still haven't unpacked everything because we have so much STUFF!!! Gah, just look at the picture. Do you SEE all of that crap in the background?!? Anyway, I got to readin'. I was a little judgy when Marie Kondo first said to pick up and hold every single darn thing you own as you listen to how it "speaks" to you, feeling its energy and asking yourself if it "brings you joy." Then she really pushed it when she said to, if the item does not spark joy, "thank the item for its contribution to your life" and discard it. Like, actually get emotional and talk to your belongings. It was a little too hippie, even for me. 1) Guilt/A Sense of Obligation: I have to keep this item because someone gave it to me. I secretly hate/don't like/can't even use this item, but I love the person who gave it to me, therefore, I must keep it. I mean, if they found out I threw it out, donated it, or sold it in a garage sale, wouldn't they be hurt? 2) Sentimental/Overly Attached: I've had this item forever. This thing was with me through Plus One, braces, proms, community college, and I can't give it up now. It's a part of my history. 3) ...Poor: I don't like this item at all, but it was affordable. Also, now that it's been purchased, it would be a waste of money to throw it out just because I don't like it. I know a lot of you reading this can relate. In fact, Kondo addresses all of these in her book, and she gives lots of at-first-kuckoo-but-after-more-thought-meaningful tips to banish those excuses and get rid of the stuff. So, then. Let's get to it. Per Kondo's directions, I began with one of my main problem areas: clothing. That photo doesn't look too terrible, but trust me. I had too much stuff jammed into too little space. Every time I pulled out a top, the one beside it came out with it. (UGH, don't you hate that?!) And again, I never even wore/didn't like over half of the stuff hanging there. The first step of the Kon Mari method is to gather and place ALLLLLLL of your clothing in one spot (she recommends the floor). I emptied the contents of my closet onto my bed, shoes and all. Well, except I put the shoes on the floor. At first, the task of pulling everything out of the closet seemed arduous and a bit terrifying, but after a while, yanking clothes of their hangers and throwing them onto the bed became kinda fun and cathartic. I was shocked by the giant pile I had when I was finished. Then I remembered that I had more clothing in our chest of drawers. And under the bed. And in my nightstand. After feeling nauseous, I rounded up everything else and added it to my pile. Next came the hard part. Sifting through the pile, picking up every individual item, and asking, "Does this bring me joy?" At first, it was so, SO awkward. Entirely weird and uncomfortable. I just laughed to myself because I felt like such a weirdo. But, after tossing the tenth or eleventh shirt into the donation pile, I was on a roll. "UGH, I've always hated this shirt. I've been looking for an excuse to throw it out for years." "This dress didn't even fit when I bought it; it was just on a clearance rack at Target." "Umm...I can't believe I still wear this ragged, holey sweater that I've had since high school. Have I seriously never noticed the condition of it until now?" "Why. Do. I. Have. FOUR. Black. Cardigans?!?!?" That was pretty much how it went. I had four piles going: 1) Keep, 2) Try to sell at Plato's Closet, 3) Donate to Salvation Army, 4) Throw away because it's that bad (...like ratty old underwear for "that time of the month"). Despite the fact that I was throwing most everything into the sell/donate piles with reckless abandon, Kondo's technique did actually fire up the tear ducts a couple of times. For instance, I came to the top I was wearing the night Matt proposed- a stretchy green tunic. That top doesn't really fit any more, and it's looking a bit ragged, but of course, I was holding onto it because of a sentimental attachment. So, following her advice, I literally, out loud, thanked this shirt for sharing such a huge, amazing life event with me, and I said goodbye. I know. It sounds SO cheesy. But it was kind of miraculous. I had a similar experience with the fifteen 5K and 10K t-shirts I had stuffed into a drawer. I rarely wear any of them, and I certainly don't need all of them, but I hoarded them because of the sense of pride and accomplishment I associated with them. No more! I have the memories of the races, and that is enough. I thanked these shirts for what they represented, for the satisfaction I felt when I was awarded them at the end of a race, and I let them go. This also made me clearly see and appreciate the pieces I wanted to keep. Like a flowy, floral-print blouse that makes me feel pretty and feminine when I wear it. Or a comfortable pair of jeans that actually make my rear-end look its best. And after a while, talking aloud to my clothes was incredibly freeing. Sure, I felt like an idiot, but it was nice. To a brightly colored, floor length maxi-dress: "You trip me every dang time I wear you, my mother-in-law once said you look 'African', and you make me look short. We're done." To my favorite boots: "You're super cute, you're surprisingly comfortable, and we've gone lots of places together. I love you, and I want to keep going places with you." To that one pair of cute brown flats: "You gave me horrible, bleeding blisters when I toured Carl Sandburg's house in Asheville, North Carolina, and ruined one of the best parts of that vacation. Get out of here." Don't judge me. Just try it. Activewear- socks, bras, and all. Jeans and pants that used to take up closet space. The most satisfying: my scrubs and work socks. I'm kind of embarrassed to admit how spiritual of an experience this turned out to be. I mean, Kondo's effective hippie techniques aside, when I saw the ridiculous amount of clothing I owned, when I saw it all piled up together, I honestly felt sick. You might say I even felt convicted. I complain about how "poor" I am, how money is always tight, how we're on a strict budget, yet I have such tremendous excess. I wanted to get rid of stuff immediately just because of that. How many of those pieces were purchased on a whim? How much money did I spend buying something just because I wanted to feel better, just to feel that little thrill that comes with swiping the plastic? And on that note, how much debt did these things rack up? This has made me completely rethink shopping. From now on, I hope I remember what I've read. I hope I remember what it felt like to dig through this pile. I hope that, when I walk into a store, I won't let a big red clearance sign lure me into buying something I don't even want. I hope that I'll try things on before I buy them, and only get them if they make me look and feel great. Gosh, I just want to get down to basics. 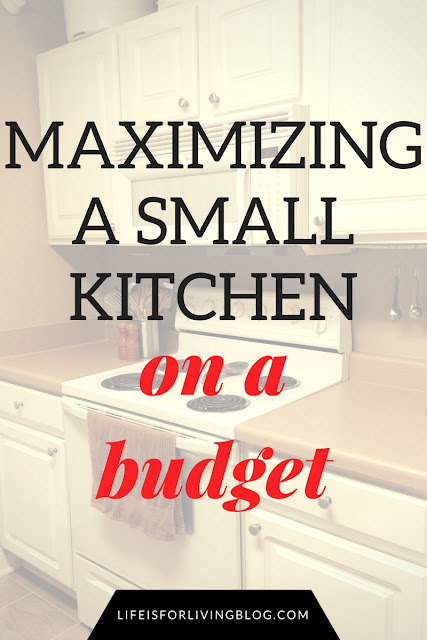 I long to attack the rest of my house, discarding things I don't absolutely love, use, or need. I'm telling you, after this, I am wholly intent on simplifying. And guess what's next on Marie Kondo's list: books. "Do not love the world or the things in the world. If anyone loves the world, the love of the Father is not in him. For all that is in the world—the desires of the flesh and the desires of the eyes and pride of possessions—is not from the Father but is from the world." Great post! 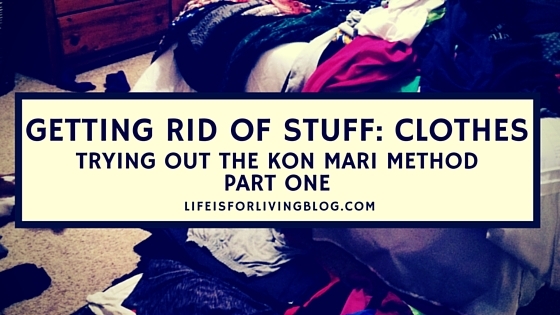 When I did the Kon Mari method, it was half heartedly...I need to try it again and REALLY let go of some stuff. I hold on to LOTS of stuff out of sheer guilt. I love how you wrapped it up with that verse. PS Annie was cracking me up. And the Jimmy Stewart GIF is totes accurate. I REALLY need to do this. 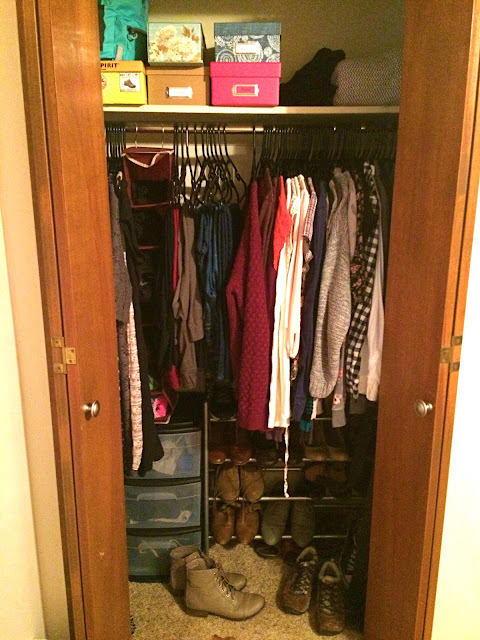 I'd like my closet to even look like your "before" picture. On top of all the other excess, I now have maternity clothes still lurking around... one year after being pregnant. In the past several months we have worked on and off at de-cluttering. Every time a garbage bag of stuff goes out to the trash or for donation it feels great. And it makes me even more aware of how much stuff still needs to go. How's this working for you more than a year later? I finally finished the book and I've been trying to psych myself up to actually do it. It is such a daunting task!